After working in the Albanian healthcare system for over the past year I have begun to understand the way things work here little by little. Healthcare systems across the world are often a point of criticism, especially in America. People are not happy with the recent Obamacare regulations and many people do not have access to adequate healthcare services. The healthcare system in Albania also is not set up for success in the current capacity, but that is why the Ministry of Public Health is constantly striving for better results and more action. Many Albanians are continually working towards a better society that impacts more and more people. That is also the reason why Peace Corps volunteers are placed in health organizations to help build capacity. Things aren’t perfect, but slowly we are working together to make this place better. The Albanian healthcare system is set up in the private and public sector. In the public sector there are two ministries – the Ministry of Finance and the Minister of Health. The Ministry of Finance controls the insurance commission that pay for public health service specialists. The Ministry of Health has authority over the regional public hospitals, Directories of Public Health (DShP), and smaller health centers. There are twelve regional public hospitals in Albania where the specialists work. Under the hospitals you will find the DShPs and then the smaller health centers and polyclinics. Family doctors work at the health centers and polyclinics. Government employees, children, people with disabilities, students, soldiers, and retired persons are covered under public health insurance and patients without insurance are expected to pay for public health services. The prices are as followed: $10 family doctor visit, $15 polyclinic visit, and $20 hospital stay. They also need to pay all the costs for all medications as well. The private sector definitely holds monopoly over the healthcare system in Albania. There are many pharmacies, laboratories, private doctor officers, speciality clinics, diagnostic centers, and hospitals. The private hospitals are mainly in larger urban cities such as Tirana, Durres, and Vlore. All dental clinics are also in the private sector. The majority of Albanians cannot afford to be covered under private healthcare. 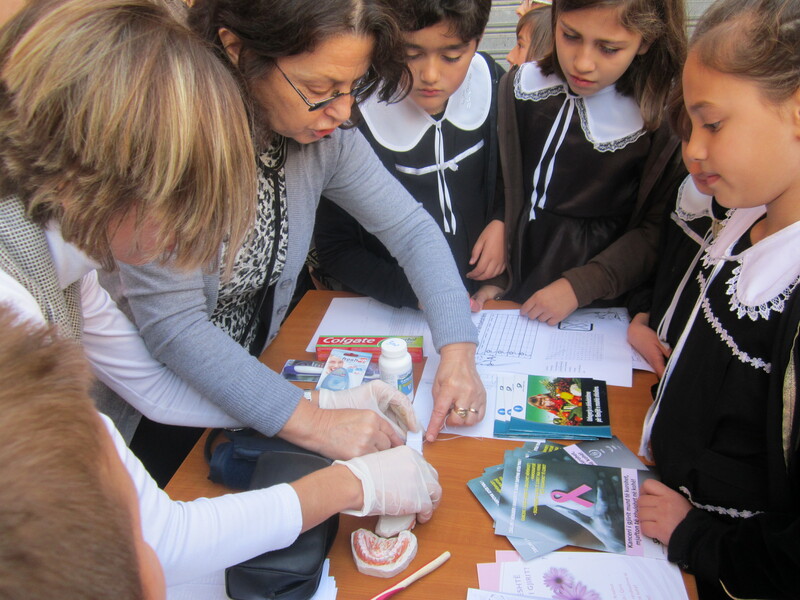 There is an interesting culture surrounding healthcare in Albania. The culture of turp (shame) causes many people to have the fear of embarrassment when it comes to health knowledge. Some doctors do not collaborate with other doctors on medical cases because they fear that others think they do not know what they are doing if they have questions or would like a second opinion. In America, it is common for doctors to collaborate and work together, especially in the case of difficult diagnoses. Cooperation amongst coworkers is not the norm and rivalry is common. I have even witnessed this within my office; some of my colleagues will fight over who gives education to certain schools based off of what their job title is. This sometimes leads to no one giving lessons at the schools. Continuing medical education is also not enforced and is often hard to find. 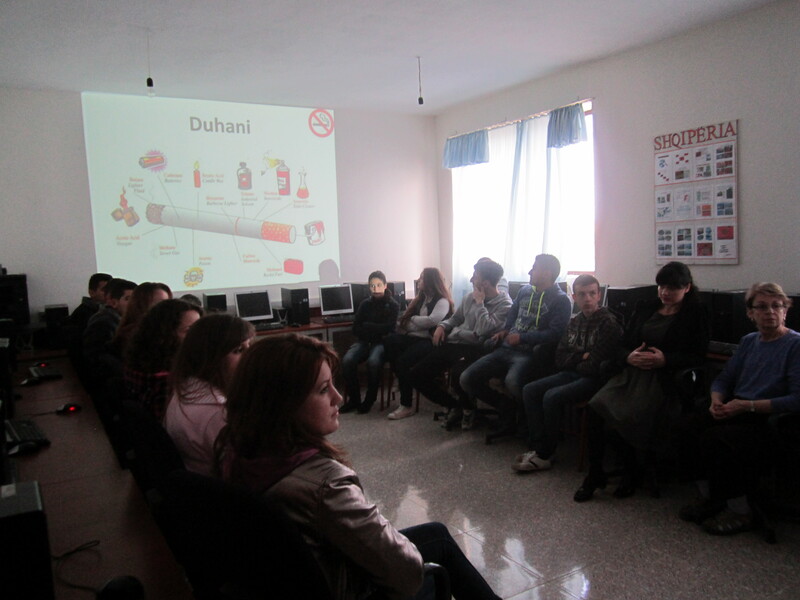 This is not only for the health sector, but also for other areas of Albanian society as well. Teachers do not attend continuing education trainings either. The ministries require workers to continue their education, but in reality there is no enforcement and no consequences if people do not attend these trainings. I have attended several continuing medical education sessions since arriving in country, but all these sessions outline basic information that can be found by anyone on the Internet. The lessons usually do not go in depth into information. There are many challenges that people face working in the healthcare system here. The system is hierarchical, political, and bureaucratic. I quickly realized this during election time last year because no one could work at my DShP until they knew who the new Prime Minister would be. If the political party changes, like it did last year, then most of the directors in control of these public institutions also change. Those in power demand respect and all authority comes back to the directors in control. People cannot step outside the bureaucracy and must receive permission for everything. There is a lack of organization and chaos. Often times maybe one or two people may know what is going on, while the rest of the office has no idea. Time management is an issue, as well as a lack of planning and proper needs assessments. Even major health events usually come down to last minute planning and fumbling around to get everything together in time. Coffee time takes precedent over work time frequently. Although, I cannot deny that a fair amount of work does happen over coffee, so sometimes coffee can actually be a good thing. Numerous people will arrive late, or just don’t arrive at all. I have several coworkers who habitually do not come into the office, or they will come into the office and then leave for several hours to go shopping. There is no accountability. Lack of proper funding and physical resources is also a huge issue. The ministry will require all public health institutions, including DShPs and health centers, to perform certain examinations and education each month, but does not provide adequate funding or resources to see out these expectations. Just recently there was a huge controversy over who would get free breast exams during the month of October because the Ministry of Public Health announced that all women over 40 have the opportunity to receive a free mammography. Sounds great, right? Problem is the only mammography machines are located in Tirana and the rest of the country does not have access to the resources needed for the exams. There were supposed to be two mobile vehicles traveling around Albania to help give examinations, but no one had any information about how to get the mobile units to visit their cities. We often run into issues giving health lessons in my community as well because we do not have the money, the gas, the car, or other resources to reach the villages outside of walking distance. The village schools and health centers are all under our jurisdiction, but receive little to no attention. Relationships are extremely important while working with people here. If you do not have a positive relationship with someone, then you don’t work with those people. This comes back to the fear and rivalry mentioned before. Trust and respect are critical. This has been one of the most difficult things for me while working here because many people are suspicious of Americans and think they Peace Corps volunteers are “spies” sent from America to keep tabs on the rest of the world. There are also ridiculous expectations of Americans. Often I am expected to do everything by myself such as creating Powerpoint lesson plans, making brochures, or anything regarding technology. Working together and transferring skills occasionally happens, but is not always common. There is an extreme lack of trust in healthcare professionals from the public in this country. Many people are not qualified for their positions and it is common for people to pay their way through school (and life) to get to the top. That being said, people are suspicious of doctors and often trust friends or family members over their physicians. Patients do not want to take medicine unless someone else in their family has used it before. Many people will lie about their previous health conditions and they will not tell the doctor what is wrong and any of their previous diagnoses or treatments. Traditional myths towards healthcare can make it difficult while working with community members as well. People believe that fresh, cold air will make you sick. Wet hair will also make you sick, especially if it is cold outside. I never previously dried my hair (because I love those natural “I-don’t-give-a-f*$#” curls that I have) and have had many conversations with community members about why in the world I left my house with wet hair and how I am going to catch a cold. I now don’t leave my house without covering my wet hair because I don’t want to cause a ruckus while walking down the road. A diet based on carbs is also supposed to be good for you. 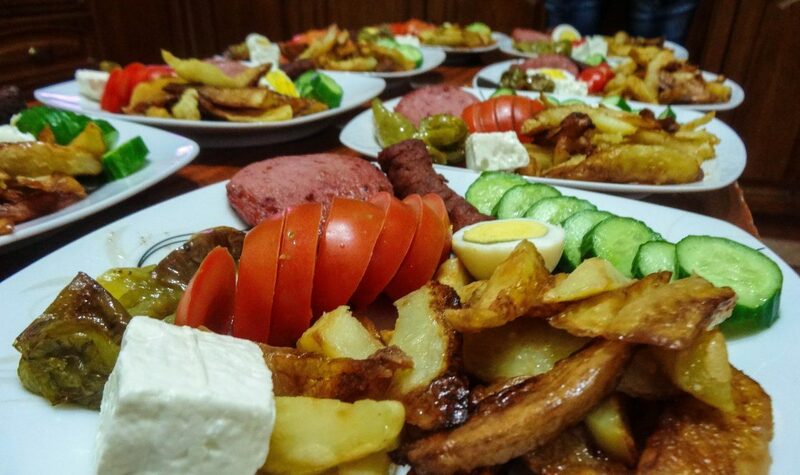 I cannot tell you how many Albanian women have told me that a diet of only potatoes is the best way to lose weight and be healthy. Ummmm, no! Cancer and other significant health problems are thought to be caused by the evil eye and bad luck. Emotional problems should be dealt with within the home and are often seen to only affect the weak. Yogurt, cheese, and rice work better than medicine. Supposedly applying yogurt to a sunburn is the best cure. People feel that they need to give money to receive proper care. There are a lot of under the counter bribes that happen between patients are doctors. People will give money to have their tests read first and they will give money to receive special treatment and jump the line. Visiting the doctor in Albania is a completely different experience than seeing a physician in the states. Like I have mentioned in blogs before, lines are non-existent here. So everyone who comes into the office requires immediate attention and often those who yell the loudest receive it first prior to those who have been waiting. Privacy is not a priority. During a tour of a village health center during pre-service training, our training group walked in while a doctor was examining a patient. The doctor motioned for us to stay as he explained a bit more about the health center, as he was continuing the examine the patient. I felt extremely uncomfortable for the patient because she had no say in the matter. Instead of wanting an examination many people want an ultrasound and an IV. So many Albanians I know go to the hospital every time they are sick with a basic cold to receive an IV. It blows my mind. I have only received an IV once when I was incredibly sick, but here people will get an IV for a hangover. Another thing that is different about visiting the doctor in Albania is that the patients are required to go to the Pharmacy to buy there own medication and, often times, their own supplies needed for regular examinations. So now I have mentioned some of the issues that the healthcare system in Albania faces. There is a need for a change regarding the way things are currently in place here. Most Peace Corps volunteers in Albania are placed in the local DShPs or health centers to work with the health promotion department. Currently there is not a health promotion department at the health centers because the entire region is supposed to be covered under the DShP, however funding and lack of resources inhibit those centers to adequately cover everyone. I am placed within the office of health promotion at the DShP in my city. There have been many challenges that I have faced working there, but I can’t deny that there have been a few successes as well. Most of my work consists of developing materials that my counterparts can use to help give more interactive lessons. Normally the way that health promotion works from my experience is that the promotion office will visit the health centers to give brochures, information, and posters. 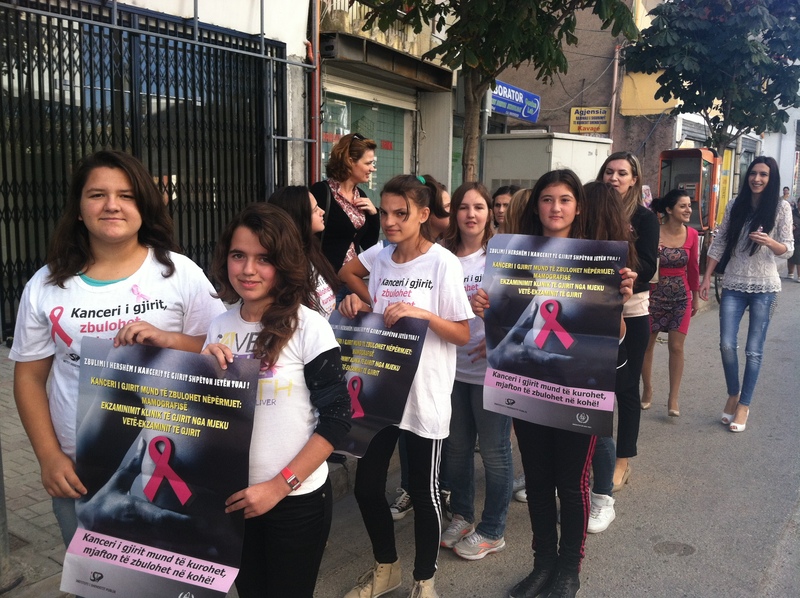 Then they will visit the schools to give short 15-minute lessons in the “good classes” and sometimes students will be used to do promotional marches in the community to raise awareness about topics such as breast cancer and road safety. Most of these activities are not planned ahead of time and involve giving a short lecture without any materials or interactive discussion. This is changing though with the health of Peace Corps volunteers and younger generation Albanians. Now we try to give more interactive presentations that involve Powerpoint, games, pre-post tests, and discussions. Often times, it is difficult to have the full class time (45 minutes) to devote to these lessons because when we give presentations in the schools. Usually we are interrupting classes that are already in sessions. Other times, we may plan to use a Powerpoint or a lesson involving technology, but the room doesn’t have the adequate resources or the power in the school is out. These are some of the many reasons why it is difficult to give health education lessons, even with adequate planning ahead of time. Things are not always awry here, despite all the difficulties that we face. I have seen strength and intelligence in some of the women that I work with. I see that certain people go out of their way to try and help despite the challenges they face daily in their work and with the system. We may not be giving health lessons everyday, or every week for that matter, but slowly educators and health professionals are building capacity to plan a project and the capacity to give an interactive lesson incorporating the audience into the discussion. I am trying to look past all the obstacles and road-blocks and just focus on the little things that I can do to help. I can’t change the system, but I can help empower Albanians to do little things to help take control over what they can do for their country. Some of our wonderful helpers during a recent breast cancer awareness march. While I was visiting Washington DC back in September for the Peace Corps Blog It Home competition we toured several agencies, including Voice of America. I actually had no idea that Voice of America is popular in Albania and learned a bit more about the station during the tour. Voice of America serves countries all across the world giving people news and information in their native language. In Albania, Voice of America is part of the national news program aired nightly. Before I did this interview I had NO IDEA that I would be filmed, which is probably better anyways because if I had known that I would be taped speaking Shqip for national television beforehand I probably would have stressed myself out. That being said, I had absolutely no time to prepare myself for this interview, so I definitely sound like a toddler. Plus I had not been practicing my Albanian most of the summer, so I was a bit rusty. Usually I can speak a little bit better when I am not under pressure, but I am still pretty proud of myself for giving a complete interview in Albanian on national television. I never expected that I would do something like this during my Peace Corps service and it truly was an honor. For those of you who do not speak Albanian and have absolutely no idea what I’m talking about I will give you a brief explanation in English. In order to watch the video you need to scroll down in the playlist and click “Xhilli in Albania” or click this link. PS: The music in this video is hilarious. Halloween has always been one of my favorite holidays. I love spending months putting together the perfect costume and decorating my house. There hasn’t been a year that I’ve skipped out on the celebrations. This year I wanted to bring some of the Halloween traditions that I have grown to love over the years to some of the students that I work with. 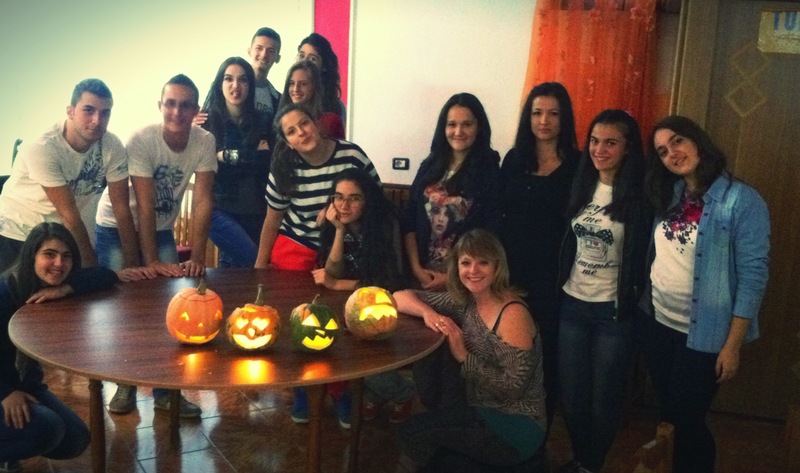 Halloween is not widely celebrated in Albania quite like it is in America. However, it is slowly becoming more popular. Some of the children go out and trick-or-treat in their apartment complex, but you do not see many children roaming around in the streets begging for candy here. Several of the city high schools have Halloween parties for the students and you will see some parties at clubs in the bigger cities as well. Dressing up in full costume is rare. Albanians dress up mainly in masks or with face paint. The women wear fancy dresses and men just wear normal clothes. 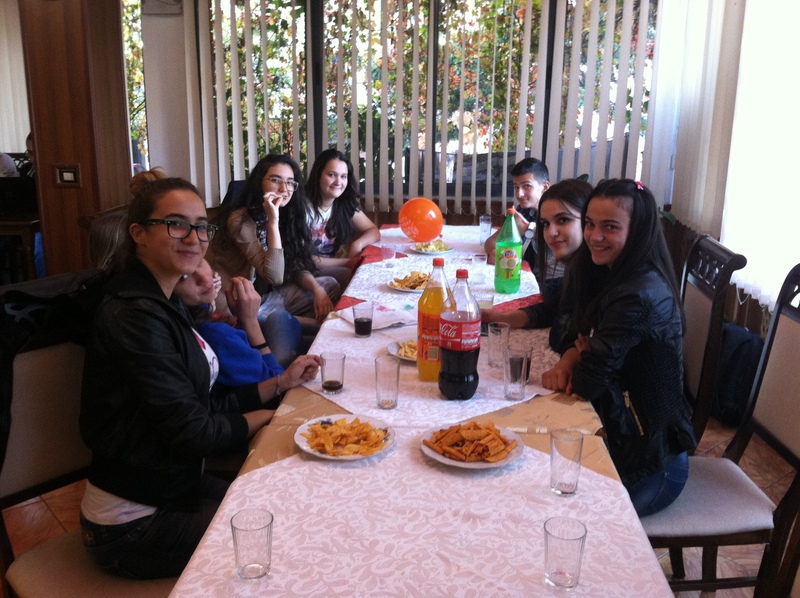 Our Outdoor Ambassadors group decided that we would have a small party for the group to celebrate the day. 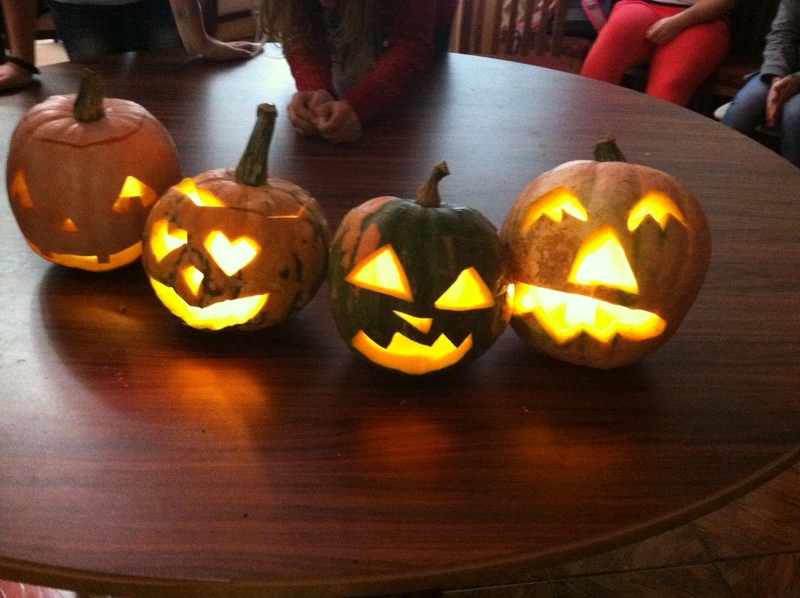 I searched the town for pumpkins and finally found a few small ones from random village market vendors. I ended up buying five small pumpkins for under six dollars. Honestly I was surprised to find any pumpkins at all because last year I really wanted to carve a pumpkin for my house, but couldn’t find one. The pumpkins in Albania are a bit different than the giant orange pumpkins that I was used to back in America. Many of the pumpkins here have a white tint with some green specks. 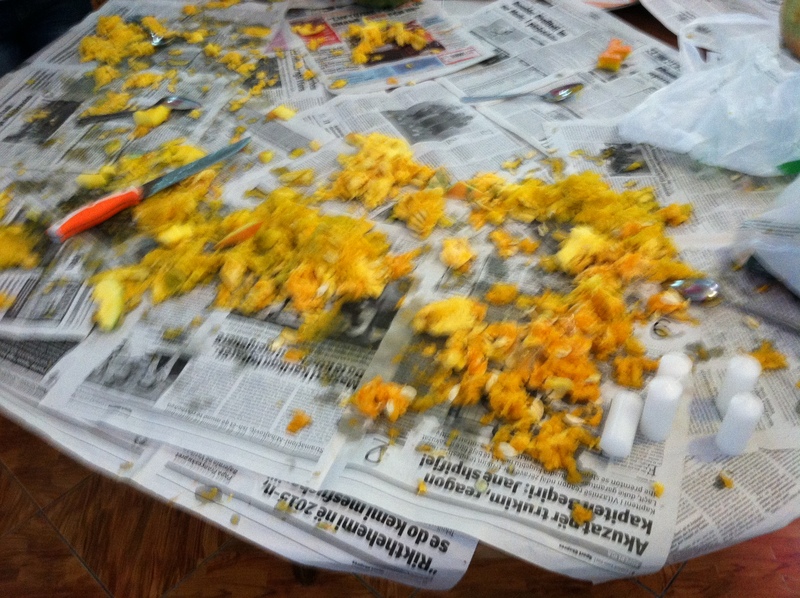 At the party we carved pumpkins, danced valle, and ate pizza and goodies. The students all pooled together money to fund the party and a few of the boys even DJed for us. I made a pumpkin brownie recipe that I found on Pinterest with buttercream frosting. The frosting just wasn’t quite the same without powdered sugar though. Overall, it was a fun time for all. 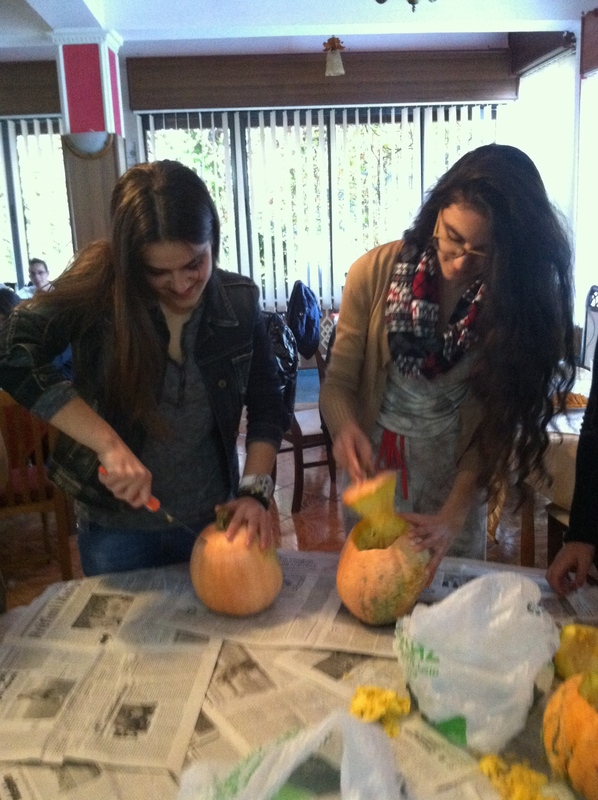 Learning how to carve the tops for the pumpkins. The guts aren’t quite as gooey here in Albania. I love our Outdoor Ambassadors students. Telling spooky stories in Berat. 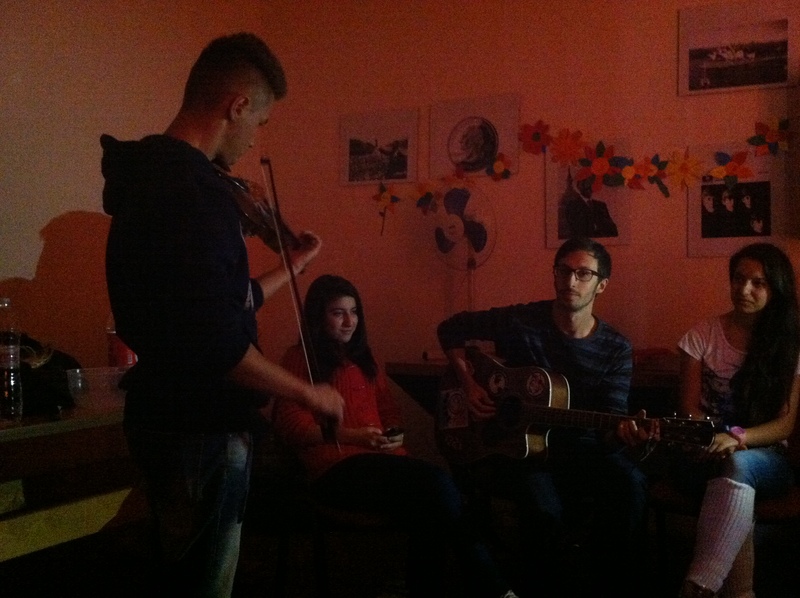 After our party, I attended another Halloween student celebration in Berat at their youth center. We played Halloween themed Charades and told scary stories. 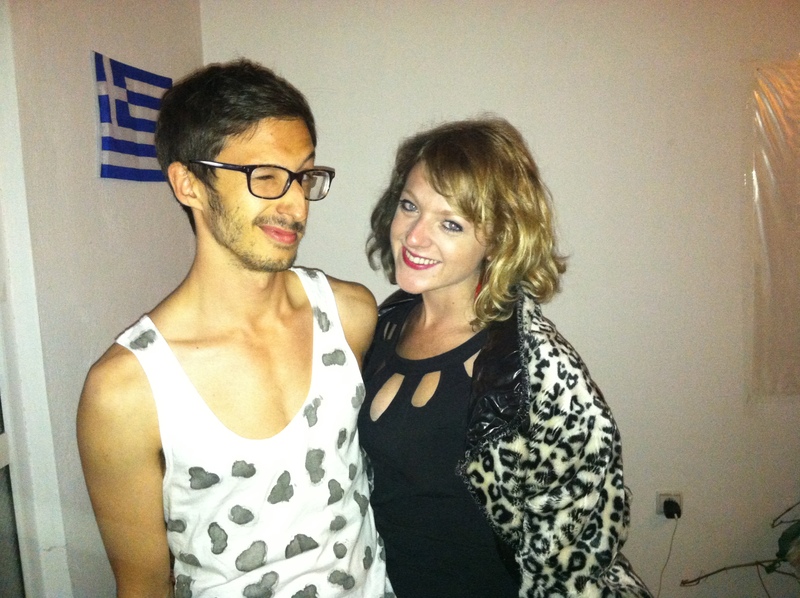 That evening we had another party for the Peace Corps volunteers. It was a great time! Can you guess what our costume is from? Can you guess who we are? !